Polish small areas with the greatest ease! Griot's Garage Professional Random Orbital 3 Inch Polisher has been upgraded to be more powerful! It provides polishing performance closer to that of the 6 inch orbital buffer. Remove swirls and apply waxes to motorcycles and tight areas on your vehicle with precision and now more power with the Griot's Garage Professional Random Orbital 3 Inch Polisher. If you're used to detailing with a polisher, there's no reason you should have to switch to hand detailing for those tight spots. Griot's Garage Professional Random Orbital 3 Inch Polisher gives you the feel and performance of a larger polisher in a compact size that goes anywhere. Use the Griot's Garage Professional Random Orbital 3 Inch Polisher to polish and wax bumpers, mirror housings, windshield wiper cowling, A, B & C-pillars, spoilers, the valence area around your license plate... plus all of the tight areas that the 6 Inch Orbital Polisher just can't reach. 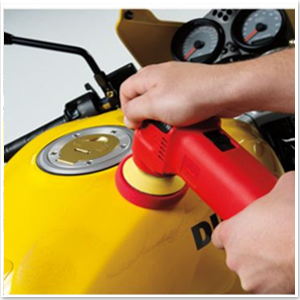 For motorcycles, Griot's Garage Professional Random Orbital 3 Inch Polisher can't be beat. It polishes painted areas easily, polishes up chrome, and applies wax quickly. Just select the appropriate 3 inch Griot's Garage foam pad for the job. The included 3 inch backing plate accommodates any hook and loop pad. The powerful 240W motor runs on a variable speed control with a range of 3,500 to 10,000 orbits per minute with six speed settings. A steel bevel gear drive gives a smooth-running power band and durability. Polish mirrors, bumpers, and other areas where a larger buffer can't go! Polish motorcycles with the Griot's Garage 3 Inch Orbital Polisher. Griot's Garage Professional Random Orbital 3 Inch Polisher is perfect for polishing paint, metal, plastic, and glass, as well as applying waxes or sealants. The long, 10-foot, power cord allows greater mobility around your projects. The Griot's Garage Professional Random Orbital 3 Inch Polisher is lightweight and easy to handle. It has an ergonomic head with a handgrip and an indention for your fingertips. You can operate the machine with one hand. 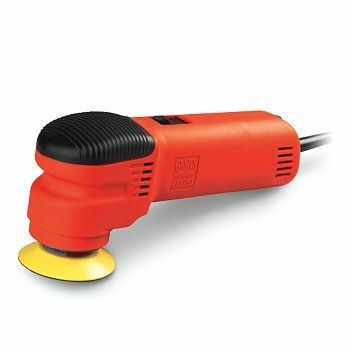 Plus, with no handle sticking out, the 3 inch polisher is better able to fit in narrow spaces. Griot's Garage Professional Random Orbital 3 Inch Polisher operates with the same safe, swirl-free random orbital action as Griot's larger 6 Inch Orbital Polisher. The random orbit, also called dual action, produces less heat and therefore will not burn or mar paint. Random orbital motion is more like hand polishing, but much faster and easier on your hands! The versatility of this machine is increased even further when you consider that you can use the Griot's Garage BOSS 2" Conversion Kit to make the machine compatible with the 2" BOSS pads offered by Griot's Garage. 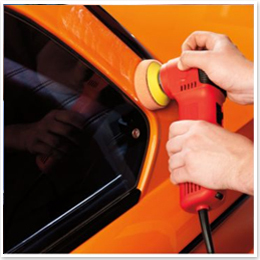 Using this machine with the smaller 2" BOSS pads allows you more freedom and ease when polishing small or niche areas of your vehicle such as the A-pillars, grille, or other intricate body panels. 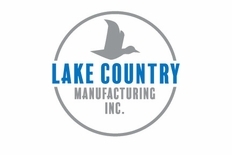 These pads also improve the machine's functionality by increasing the pad rotation to allow for better correction potential and reducing the likelihood of the machine bogging down or stalling during use. Griot's Garage Professional Random Orbital 3 Inch Polisher is a perfect companion to our 6" Orbital so you can achieve paint polishing perfection in any area. Enjoy paint perfection! Griot's Garage 3 Inch Random Orbital Polisher HD! The HD model has a heavy duty 25 foot power cord hardwired into the polisher. The longer cord is more convenient than an extension cord and it is gauged to deliver maximum power to the polisher for safe, efficient operation.